Printed for John Stockdale, Piccadilly, London, 1807. 1807., 1807. Uniform matching hard back binding in half burgundy leather, five raised bands to the spines with gilt title lettering and list of plays between two sections, top edges gilt, fore edges untrimmed, pink pebble cloth covered boards, gilt ruled lines to boards and corners, burgundy marble end papers on thick card stock. 4to 13'' x 11''. First published in 1773, this 1807 printing is beautifully illustrated with 11 full page monochrome plates and 11 vignettes engraved by Heath after Stothard, Fuseli and Hamilton, all with tissue guards. 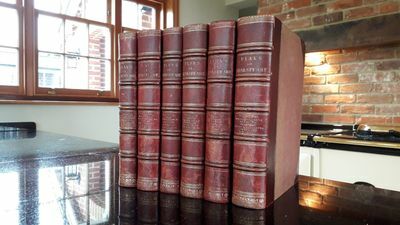 The text block is clean and white with only light foxing on the few first and last pages, the heaviest being to the plates, rubbing to the edges of the spines, corners and across the raised bands, bindings are tight and sound, stunning set. Weighs 27 kg. Member of the P.B.F.A.